Chamber of Secrets is definitely a lesser film than Sorcerer’s Stone to me. This is where subject matter is introduced that cuts deeper – a moment like seeing, “The Chamber of Secrets has been opened. Enemies of the heir beware,” written in blood is terrifying – but the whole thing lacks the proper punch. A moment like that, and some others in the film, need a more palpable menace – not as much menace as Voldemort’s upcoming rebirth, but I wish the mood of this movie was more vividly felt. I’m glad that Columbus basically got out of the way in Sorcerer’s Stone and stayed so true to Jo Rowling’s voice, but here I wish there was more directorial presence. There are times at which Chamber of Secrets feels like a reenactment of the book than a film adaptation, and the pace is much too sluggish. It’s not that there are so many sections or events that I would cut – I actually don’t know if there are any – but out of all seven/eight, this one feels the least alive as a film. All that said, I do really enjoy this film. I love how the wizarding world is growing and showing that it’s far more complicated than we knew, I love how this clearly builds to Voldemort’s return and whatever fallout may come from that. It’s just not the film it could be. I don’t have much to say about this screenplay; I think it’s fine, but perhaps too literal in its “adaptation.” The biggest departure is not including the Deathday Party, which is a very obvious scene to cut – it’s fun, but it lifts right out. It would shock me that so many fans have complained about that change, but for every scene, event, or thing in all of the Harry Potter books, there are people attached to it. My gripe here is that Kloves’ favoritism for Hermione shows here in an annoying way, and we all know what I mean: There are a few lines that were Ron’s in the book, that should still be Ron’s in the film, because they make more sense for him to know and say. It makes more sense for Ron to tell us what a mudblood is (even if it is in between vomiting up slugs), or tell us that hearing voices isn’t normal even in the wizarding world. Not a major drawback, but irritating. It detracts from Ron’s character just a little bit. I won’t say that these three have devolved into one-dimensional characters, but they do feel more like caricatures in this movie than in any of the others: Harry the unquestioning, blank-slate hero; Ron the comic sidekick; Hermione the source of all knowledge in the universe. That sounds like I hate the way these characters are rendered here, but I don’t – however, it’s somewhat of a letdown, partly because of the writing, partly because of the acting (and, of course, the direction). Dan Radcliffe was not the most dynamic presence the first time around, but his performance had far more life to it then; he’s pretty flat through a lot of this movie. Harry’s turmoils are more internal here (Harry’s turmoils seem to be more internal in the even-numbered installments) – it’s not the wonder and awe of being brought into a world of magic and endless possibilities of Sorcerer’s Stone, it’s not the drive to repay the man who betrayed his parents of Prisoner of Azkaban, it’s not the all-encompassing angst of Order of the Phoenix. It’s, foremost, a worry that everything he doesn’t know about his family/past could come to something terribly destructive, something he can’t even control. (The only scene that was cut that I wish hadn’t been is the one where Harry confides in Ron and Hermione about being able to do something you don’t know you can, and what else that means.) It’s more difficult to make that really compelling, I’m sure. It’s not a failure of a performance – Radcliffe is still engaging and likeable – but you want more from it. As for Rupert Grint’s Ron, when I remember Ron in this movie, I mainly remember a lot of irritating mugging and squealing. Yes, we do have the scene with Harry and Ron trapped in the car as the Whomping Willow is attacking it, and the scene with the two vastly outnumbered by acromantulas. Yes, Ron’s terrified of spiders going into that. Yes, his wand breaks early on. Ron doesn’t have much to do in this story anyway, and again, much of his dialogue is given to Hermione, so Ron comes off as a simple scared second banana in this case. Grint has not lost his charm or comic ability, but he’s kind of annoying this time. Emma Watson, however, improves noticeably. She’s more poised, more confident, funnier as a Hermione who’s the brains of the bunch, obviously, but also now willing to break a few rules if there’s a real need. I can see Tim Roth playing a very effective Snape, but Alan Rickman is too great an asset to seriously conceive of anyone else in that part. In the same vein, I can see Hugh Grant playing a great Gilderoy Lockhart, but Kenneth Branagh’s is perfect, so there’s no missed opportunity here. This is one superb comic performance; Lockhart is charismatic, overwhelmingly conceited, and detestable. Lucius is the real villain of the second film. And Jason Isaacs gets the character – he gets that for all the plotting Lucius does to open The Chamber of Secrets, it comes down to the scary, deeply troubling fact that what we’re dealing with here is a racist. He’s a cold, cruel, vicious figure, and we see that Draco’s apple does not fall far from Lucius’ tree. He is one-dimensional, and Isaacs’ performance is over the top, but not in a pandering way. He gets it, and he has a great deal of fun with it. I think Coulson makes for a very good Tom Riddle, although I’m not as positive on the performance as I once was. He certainly has the sinister, cunning edge, and a good deal of charisma; I wish there were a little more nuance to it, I guess. Who wouldn’t want Molly and Arthur as their parents? The Weasleys vs. the Malfoys is not a full contrast yet, because we haven’t met Draco’s mother, but we all know that the differences are huge and what those are. Walters (who we met briefly in Sorcerer’s Stone) and Williams bring wonderful energy to their parts, Walters’ Molly the more stern, Williams’ Arthur the more easygoing. Molly and Arthur are Harry’s parental stand-ins, and the Weasleys are the great true family unit that he didn’t have, but ends up being brought into. Oh, Dobby, it’s…it’s hard to like you. Look, Dobby is annoying, I’m not going to deny that. And we all know he’s supposed to be. He’s also pitiable and sympathetic, then likeable in his childlike sincerity. 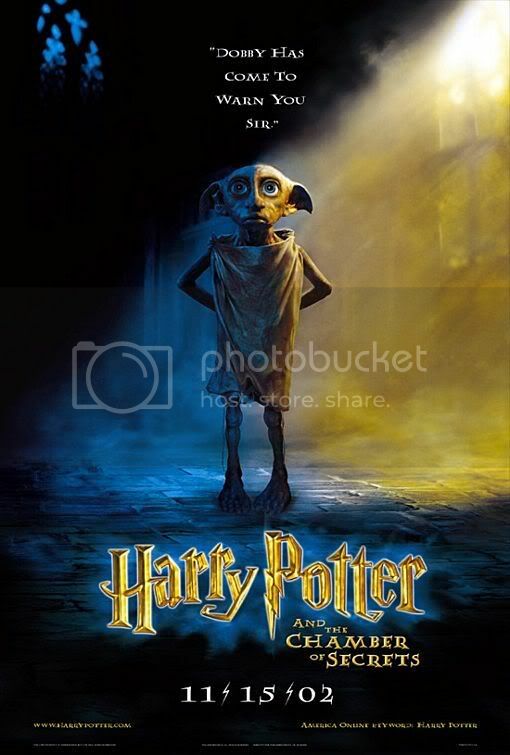 I still can’t believe that there have been any comparisons to Jar Jar Binks, because, if nothing else, at least Dobby has some value as a character; he’s not an (horribly failed) attempt at comic relief alone. Toby Jones’ voice acting is great; he doesn’t try to make the character any cuter or easier to take, he is somewhat shrill, but Dobby’s too good and sincere to not embrace. Speaking of annoying…Moaning Myrtle is a grating presence, but Shirley Henderson is hilarious. The fact that she was 36 when she shot Chamber of Secrets doesn’t matter, because she’s so vivid as this teenage girl who can’t let go of her own resentments and traumas, so she’ll hang around and haunt whoever comes into her territory (hard to resist using the word “emo’ about Myrtle). Her scene in Goblet of Fire is a tour de force of inappropriate behavior, too. It’s not as outstanding or distinctive a score as Sorcerer’s Stone or Prisoner of Azkaban, but there’s some great stuff here. The “Fawkes the Phoenix” and “Gilderoy Lockhart” themes are the best and most memorable. This world is getting bigger, richer, and more textured, and it’s great to watch. Environments are larger and more convincing, even if they don’t feel lived in really. The scale and detail is impeccable, it really can’t be said enough – from the new Burrow set to the new Defense Against the Dark Arts classroom (a virtual shrine to Lockhart) to The Chamber of Secrets – it’s all spectacular. -It’s the tiniest thing, but if I’m not mistaken, in the book, there’s mention of Harry, in his detention with Lockhart, tuning him out but occasionally catching a platitude like, “Fame is a fickle friend,” and, “Celebrity is as celebrity does.” They’re not together. But in the film, those two lines are simply one after another, and that makes it even funnier. -The picture of Lockhart on his broom might be among the funniest things I’ve ever seen. -“Blimey, Harry’s got himself a rogue bludger!” I find that so cheesy it’s hilarious. -Right after that is my favorite Ron moment in the movie: His sort of attempt at bravely taking action, raising (what’s left of) his wand and declaring, “I’ll stop it!” before Hermione kills the moment. -How much importance “expelliarmus” has in the final movie I actually don’t know, I'm not sure how much they've kept there, but you have to love that Snape is the first person Harry sees perform it. -The fact that just about every spell in that scene does the exact same thing – blast your opponent across the room – kind of bothers me. “Expelliarmus” is inconsistent in that – sometimes it blasts your target across the room, sometimes it does just disarm them. I guess the explanation is it depends on the force of whoever fired the spell. -Favorite Malfoy moment: “I didn’t know you could read.” I love Tom Felton’s timing on that – it’s not a joke, he takes it as interesting trivia. -The scene where Harry first communicates with the diary doesn’t work for me, because it feels so awkward. Harry only starts talk-writing to it because the plot says he has to, and besides, I just hate the convention of people reading aloud whatever they write as they write it (I don’t know anyone who does that). I guess the scene has to be that way, though. -JKR has that terrific knack for introducing something, like the diary say, using it perfectly well initially, and then making it far more significant than you knew in a way that makes perfect sense – building on it in a way that makes perfect sense and makes perfect sense along with what it was at first. Before Half-Blood Prince, you don’t think of this as a part of Voldemort’s soul exactly, but once you find out that’s what it is, it fits perfectly, and makes Chamber of Secrets more interesting in retrospect. -The spiders in this movie don’t scare me at all – spiders aren’t a fear of mine anyway, to be fair – but the scene in the acromantulas’ den is a standout. -The last great scene between Harry and Dumbledore for a while, and the last where Dumbledore properly explains anything. Radcliffe has fantastic moments with Gambon, but he and Harris had a different rapport, and one that I think is more effective. Among the other reasons it’s a tragedy that Richard Harris passed when he did, it’s a shame these two actors didn’t get to grow their portrayals of these two characters together over the entire series. -Ron sidestepping the hug with Hermione and going for the handshake is such a fun bit of foreshadowing. -Yeah, that last scene is hard to watch. Harry saying, “There’s no Hogwarts without you, Hagrid,” is fine because for him, it’s true, but the way it builds is just ludicrous sentimental excess. -Chamber of Secrets is the longest film in the series, at 2 hours and 40 minutes (that is, if unless you look at Deathly Hallows as one massive film), which is sort of shocking. It's a flawed adaptation, but Harry Potter and The Chamber of Secrets has far more strengths than weaknesses. It's exactly what you want from a sequel: It takes the world and the characters established in the first film, and expands on them, makes them richer adds more dimension, makes them more complicated. It takes on more mature, complex subject matter, and has the mixture of excitement, heart, and humor that made Sorcerer's Stone successful. Last edited by IenjoyAcidPops; June 20th, 2014 at 4:19 am.